This elegant lady's wristwatch features a beautiful mother of pearl dial adorned by applied Roman numerals. 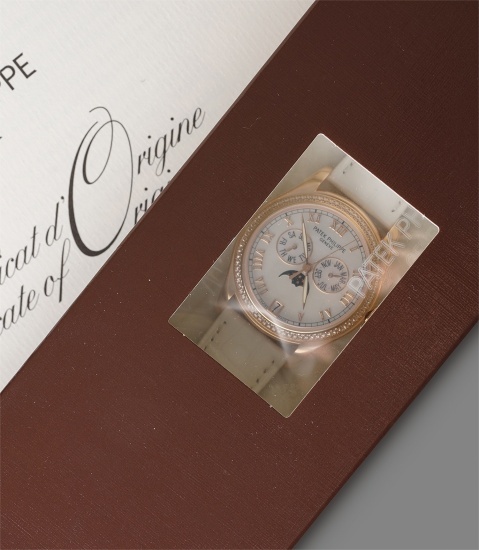 The pink gold case is set with brilliant cut diamonds as is the crown giving this complicated watch an added touch of glamour. Launched in 2007, reference 4936 is the ladies’ version of the automatic wristwatch with annual calendar, date and moonphases. Powered by the in-house caliber 324 S QA LU, the watch is just a little smaller than the male version sporting a nice and contemporary 37mm case diameter. The automatic caliber coupled with an annual calendar makes this timepiece a very convenient companion that will only need an adjustment once every 4 years. Available in white, yellow or pink gold with a black or white mother of pearl dial and water-resistant up to 30 meters this watch is designed for active and elegant women who would not compromise on style while leading an active life.